This traditional ink landscape composition depicts the revolutionary landmark town of Yan’an in Shaanxi, where the Long March of 1934–5 ended and the Comminists established their base in the war against the Nationalist army. It was at Yan’an in 1942 that Mao delivered his talks on art and literature, in which he set out the premise that art should serve politics and the people.The pavilion in the foreground is similar to those in many of Qian's landscapes, including those of southern China. 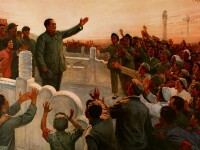 In the second half of the Cultural Revolution, from 1971-76, it became possible for artists once more to exercise some choice in the style and subject matter of their work, and to attach their own names to it. 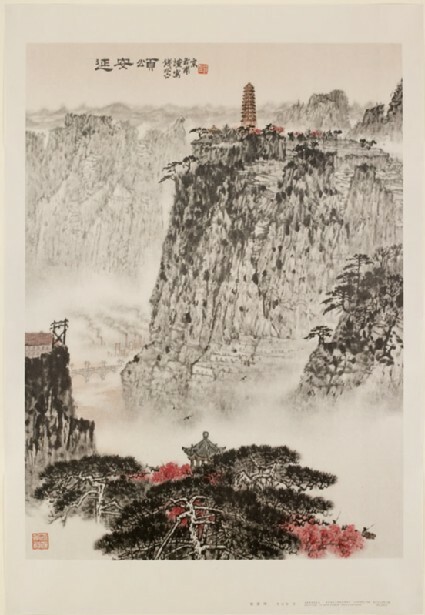 The painting reproduced in this poster is inscribed, following the larger characters of the title: ‘mindfully drawn by Qian Songyan in Nanjing’. It was common practice throughout the history of landscape painting in China for the artist to paint in his studio a landscape that he might have visited far away, and to record that on the work.